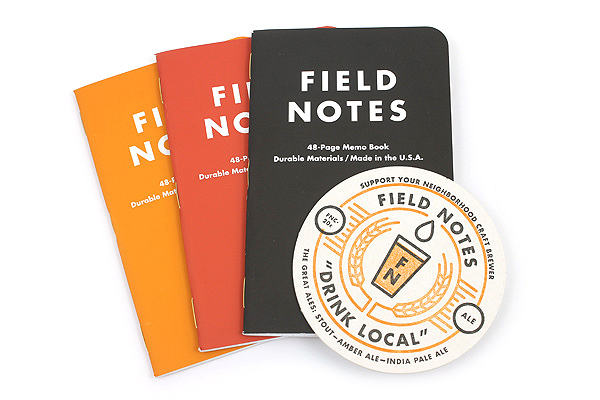 My favorite online retailer JetPens went live with their stock of Field Notes "Drink Local" Editions yesterday, and I have a 3-pack of Ales and a 3-pack of Lagers to giveaway. This is one of the best Field Notes releases in a while, so belly up to the bar - this round is on me! Leave one comment on this post anytime between now, and Saturday night at 11:59 PM Eastern Time. You are limited to one entry. This contest is open to US and International readers. For this contest, I will pick two winners at random from the comments section of this post. The comments will be numbered in the order they are received, i.e. the first comment is #1, the second #2, and so on. The Random Integer Generator at random.org will be used to pick the numbers of the winner. The contest winners will be posted on Sunday, October 13th. The winners will have one week to email me via the Contact link at the top of the page to claim their prize. Posted on October 10, 2013 by Brad Dowdy and filed under Field Notes, Giveaways.